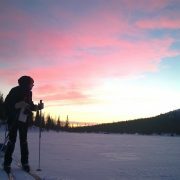 Powder snow… Everybody in Lapland knows what it is, how wonderful, soft and light it is. It is anxiously anticipated until the crust of snow finally gets deep and fluffy as ever. It can be described with words and pictures but you actually understand the real fun and loveliness of it only when you experience it first hand. 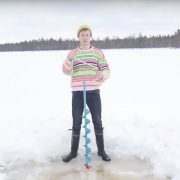 On the morning of February 1, just when the sun was only preparing to spread warm rays on the vast Lapland, we headed to the ice of the mighty Ounasjoki river to experience the thick and untouched crust of powder snow. 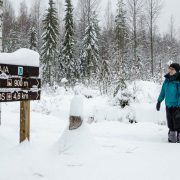 According to the information provided by the nearest measuring point, the depth of snow was at 77 cm but the wind had thrown the snow blanket even higher at some locations. At a short distance, on the river there is a sandy island which, I heard, had gotten a thick blanket of snow during winter. So, there we went and leaped into the snow! Our feet fell deep into it as we stepped down from the snowmobile – at first the snow was knee deep, then even deeper with the slightest move we made. We trudged in the fluffy snow, enjoying every moment like children. 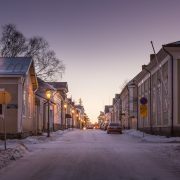 The air was still and quiet, and it was lovely to follow the arrival of daylight onto the powder snow of Ounasjoki river. 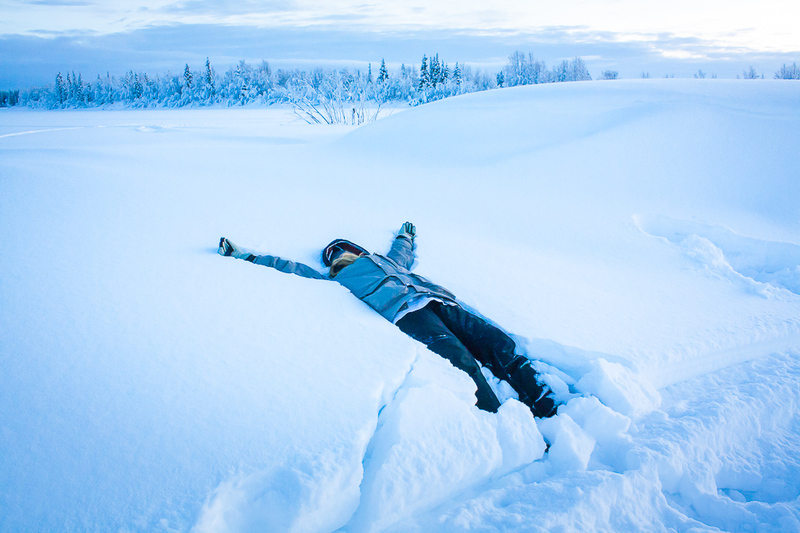 I use to make first contact with untouched snow by dropping into it with straight legs; this is how I sometimes lie in the snow at home by night, watching northern lights and listening to music through my earphones. I wore as many as two hoods over my head and made sure that the bandana scarf stayed right where it was supposed to. I also checked that I had pulled the zipper of my coat all the way up and that I had closed my pocket – should my phone have slipped down into the snow, it might have been lost forever. No, I’m not Chewbacca, I just forgot to tie my hair up. Preparing for the leap wasn’t all that simple because my feet sank into the soft powder snow even when I tried to stamp it down to make a solid base. You need to have proper clothing, for rolling in the snow is fun only if you manage to stay warm and dry. Just having cold toes can easily ruin the experience! That is why I always wear winter boots and other outdoor winter clothing for this purpose. The winter coat must be wind-proof and warm. It is good to have snow locks at sleeves and hem to prevent snow from slipping inside your clothes. For that purpose, it is also good to wear suspenders on your winter trousers and to have snow locks at trouser legs, too. Snow locks and warm mittens prevent powder snow from entering the sleeves. Our boots plunged countless times deep into the snow on the sandy island. There were a few more stable layers of snow in between but then with a step forward we might plunge even deeper. 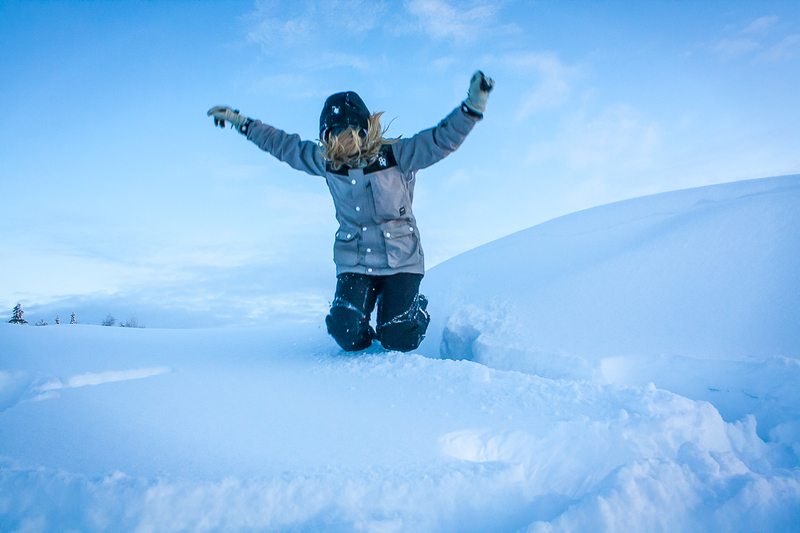 It is hard to make through a crust of snow like this but the fun makes up for it! 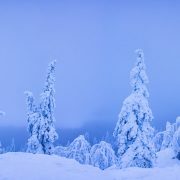 The snow is like the most comfortable armchair when you sit in it – it feels like sitting on fluffy air. 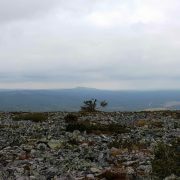 When you do that and take a look around at the vast Lappish landscape, it always makes you feel like you could stay there forever. At that point, the snow locks and proper mittens prove to be extremely useful; the soft snow doesn’t really help in getting up. 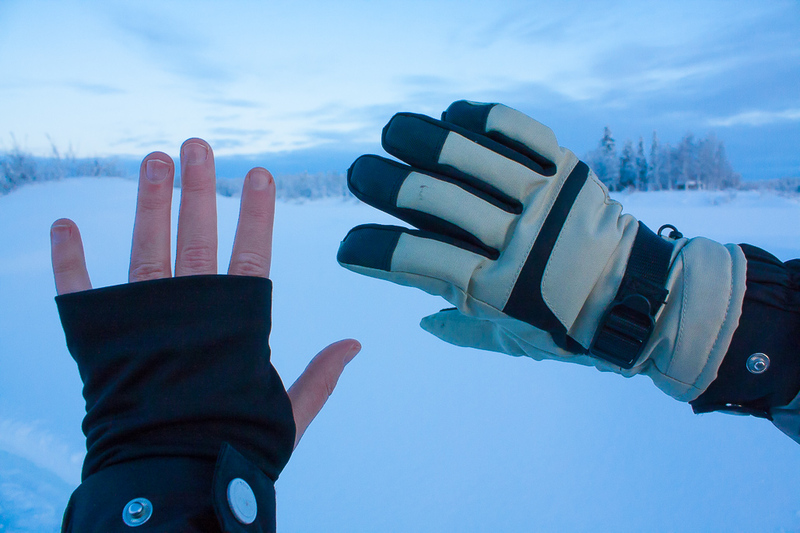 You try to use your hand as a support but it plunges deeper and deeper into the snowy abyss. Then you try the other hand and both legs, with no better results. The more you struggle, the deeper you fall into the snow! First you are in a sitting position trying to get up, only to end up lying with your back against the cold. I began to laugh at myself. What a desperate mess! I rolled myself into some kind of a crawling position and tried to lift my body by crawling backwards. The attempt was a successful one, judging from the fact that I am no longer there, in the snow. All this might make you think of the cold but in fact if you are properly dressed, it won’t get anywhere near your body. Playing in the snow actually makes you sweat! 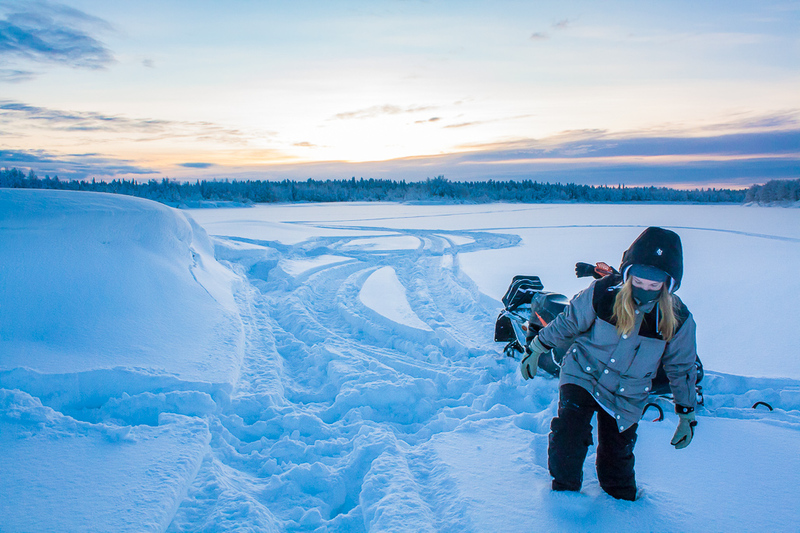 For as long as you have fun in one spot, you don’t need snowshoes or skis. They are made for transportation and they would only ruin the snow immersion experience. Just like Finnish Lapland in general, untouched snow when approached with the right mindset is a sure remedy for all kinds of moodiness and grumpiness. 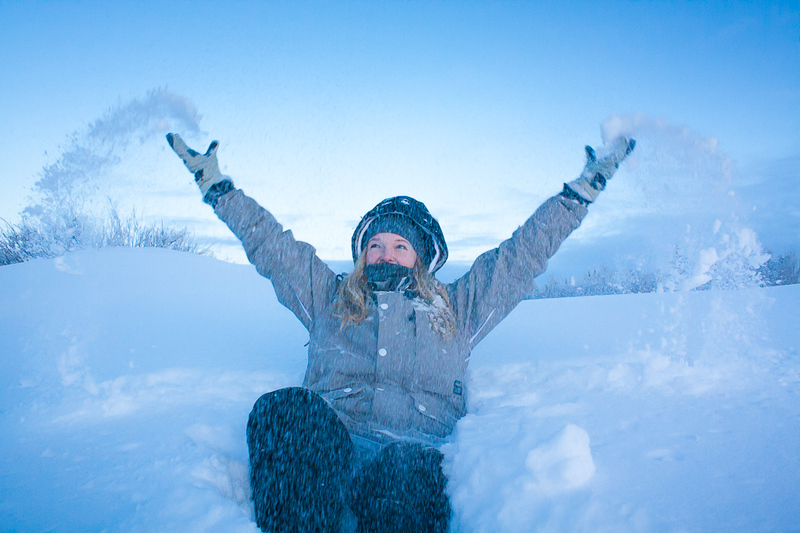 When an adult finally has a chance to play like a lemming in the infinite soft snow, joy and laughter are only natural to burst out.